This part of the Windward Coast leading up to the North Shore looks like the Hawaii of fantasy, with glorious mountains on one side and the electrifyingly blue ocean on the other. Originally a tiny Hawaiian fishing and taro farming village where folks lived in grass huts, Hau’ula is now a charming little community of affordable single-family residences and condos. Sandy beach parks line the makai side. Kahalu’u, the northernmost of the neighborhoods, is the most luxuriant in plant growth. It’s a tropical nirvana wedged between the incredible cathedral spires of the Ko’olau Mountains and the clear turquoise of Kaneohe Bay. Home prices vary from mid-range to expensive, with views that will take your breath away. 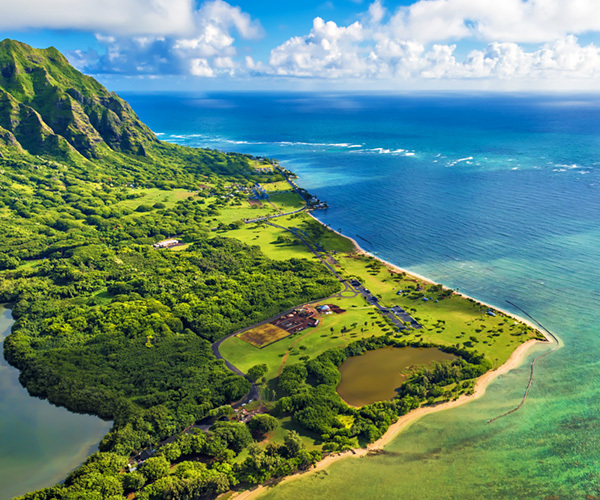 Located at the foothills of the Ko’olau Mountains is Kaneohe, the second biggest community, with 40,000 residents. It is home to both Windward Community College and fabulous Ho’omaluhia Botanical Garden. Mokapu Peninsula, which rests between Kaneohe and Kailua, is the home of Marine Corps Base Hawaii, formerly known as Kaneohe Marine Corps Air Station. In addition to moderately priced homes, Kaneohe has a wide selection of townhomes, condos and apartments. Both H-3 and Likelike Highway connect Kaneohe with other areas of Oahu. Right now, Punalu’u is the tiniest community of them all, but lots are on the market, developers are developing and a few fee simple homes are for sale in the middle to upper price range.